Rihanna was in the audience for the latest Summer Sixteen stop. Drake and Future's Summer Sixteen tour got back on track after a robbery in Phoenix with a show in Los Angeles last night, September 7. 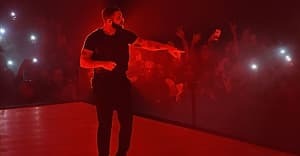 The Staples Center show saw Drake joined on stage by Snoop Dogg, who performed "Drop It Like It's Hot" and "The Next Episode" during a brief solo set. YG, meanwhile, joined Drake to perform their track "Why You Always Hatin?" Rihanna was in the crowd for the show, and was snapped by one fan rapping along to "Started From The Bottom." Check out footage from the show, via Word On Road, below.